we are exited to announce our upcoming release of Black Marble Next Generation, with the release of Prepar3D v4.3 it is now possible to push the boundaries even further. Black Marble will now be referred to as Black Marble NG as in Next Generation, with a new look, a new feel and amazing night views like never before, seen for miles and miles, as far as your eye can see, more lights, more colors, all with native sim controls, you can make changes on the fly, we have a NEW BlackMarble NG Control Panel (still in development and will be released later on), we don't want to spoil the surprise but there's much more! Looks good! Can you adjust the number of stars you see? I have seen that many stars in the sky, but only when I was in the Sahara, miles away from any light pollution! One final question... How does it fit with ORBIX scenery? 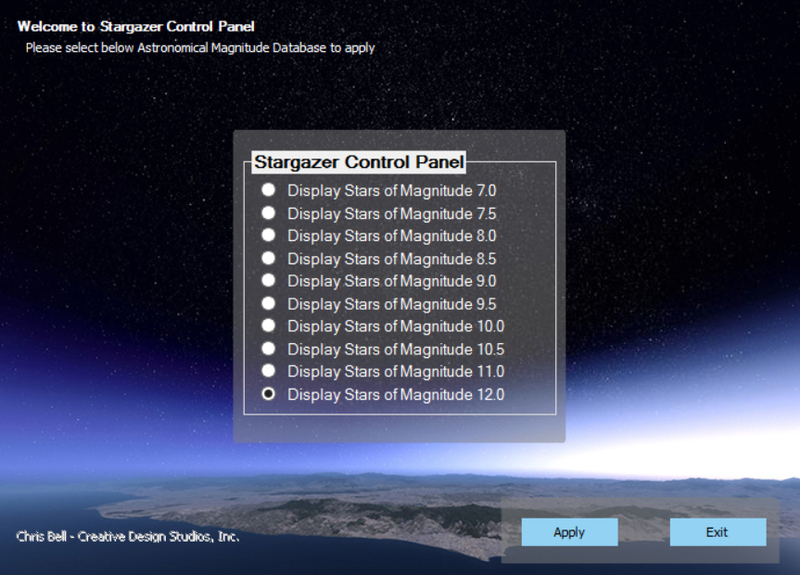 IMO your star view-ablilty panel should stop at Magnitude 7.0, not Start there. The faintest unaided viewable magnitude is 6.5...add any white lights and that will drop to 5 or 4. No one can see mag 7 stars without optical equipment or EXTREMELY dark night skies...and above mag 8 Only with telescopes. The night sky scenes above in the video are totally unrealistic especially given all the City Lights below...sorry Chris. Stargazer is a separate product Matt! we went from none to having many options now; to each his own with regard to visual preferences! Note: this is about Black Marble Next Generation which is presented as a whole in the video with Stargazer as garnish! I thought you were trying to simulate an accurate looking night sky experience. Omitting the ability to hide the dimmest human-eye visible stars (by starting your options at Mag 7.0) is missing the possibility to recreate that. I was just pointing out that your options should enable hiding stars down to at least mag 2.0 to simulate City Light Night Sky or a Full Moon sky which would obliterate being able to view stars above mag 3.0-4.0 regardless of altitude. Chris, please excuse my ignorance, but Stargazer is a separate product, yes? I am presently reviewing Stargazer and hoped to publish this weekend, but RW events has put a stop to that so it should be along soon. I agree with you Matt, and this particular point will be highlit in my review. I thought so Chris, I just got home from a very long day at work and my brain is frazzled!